Activities in the Real Estate Sector of India have increased over past few years. This has led to the growth of the Construction Sector as well as the Real Estate Sector. 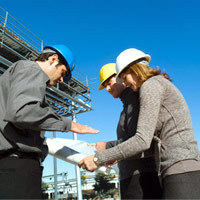 Many Building & Development Projects have come up in India. Consequently, the need for proficient manpower at all levels in the Construction/ Real Estate Industry has increased. We are elated to bridge the gap between the job seekers and the hiring companies in these sectors. We recommend candidates with the most relevant profiles for the posts of Site Supervisors, Architects, Civil Engineers, Property Valuers, Real Estate Lawyers, etc.